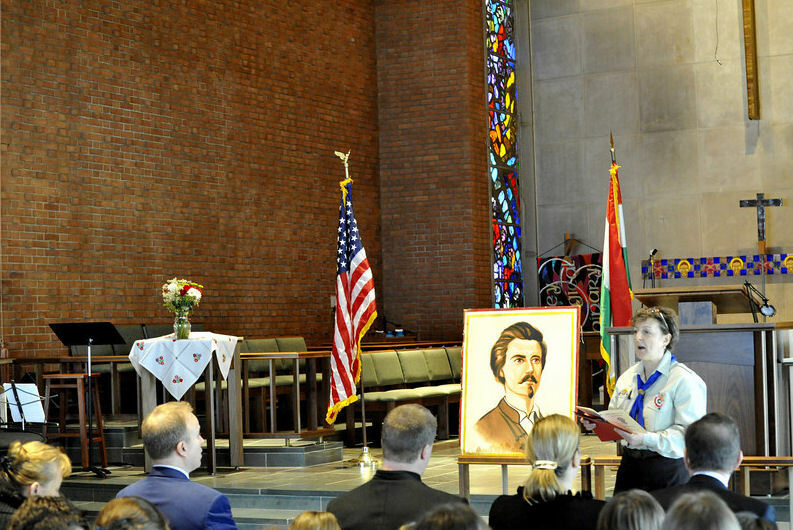 3/15/2011 - Hungarian Americans commemorate Hungarian National Day. 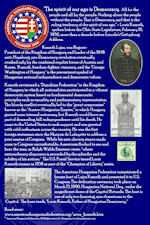 The 1848 Hungarian Revolution, under its leader Louis Kossuth, sought to throw off the Austrian Yoke. It failed after Russian intervention, but its impact on the United States is felt even today. 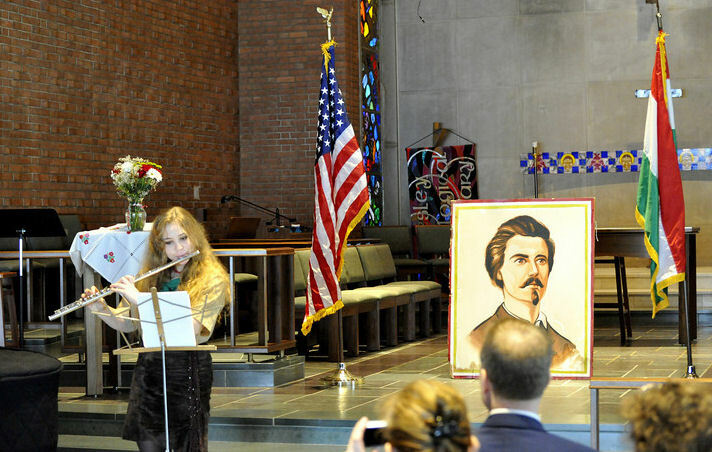 This year's commemoration of 1848 was organized by the American Hungarian Federation of Metropolitan Washington, DC, and held on March 13, at 2:30 p.m., at the Wesley Theological Seminary Chapel in Washington, D.C. 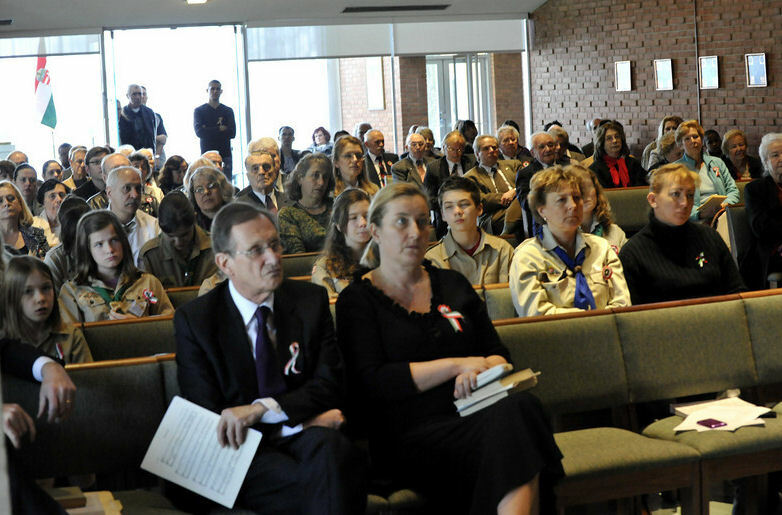 Similar events were held across the country. 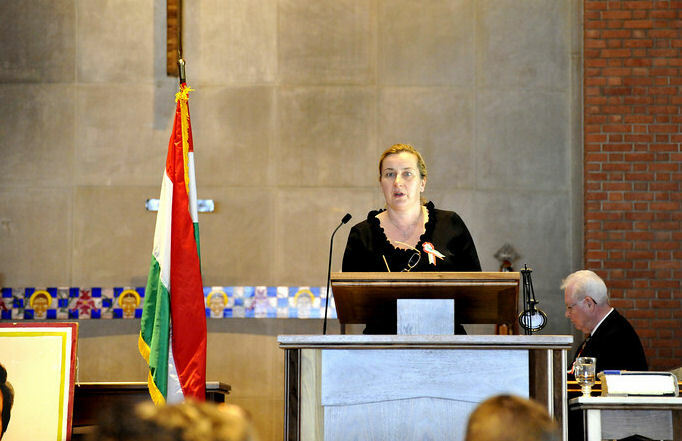 "We come to the part of the program when we switch to English so that those of you whose primary language is English can participate with us in our commemoration of Hungary’s democratic revolution and war independence of 1848 - 1849. 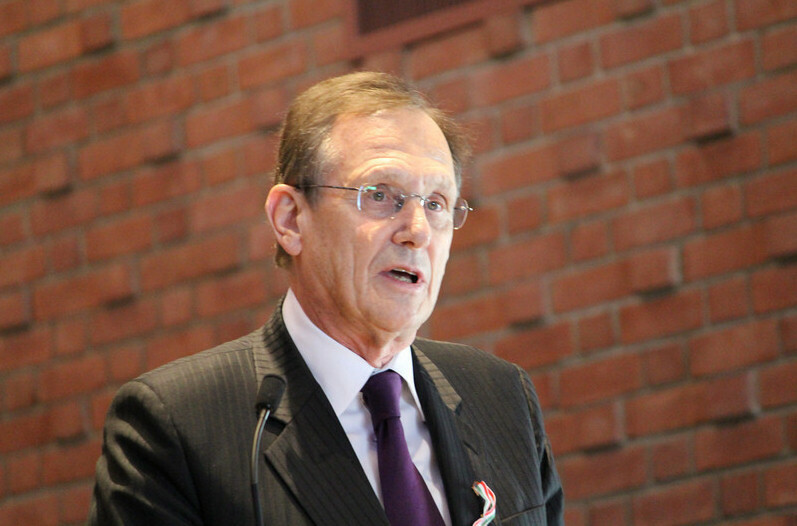 Actually, I will focus on Lajos Kossuth’s highly acclaimed trip to the United States from December 4, 1851 until July 14, 1852 – a trip made for the purpose of urging and convincing America to intervene on behalf of defeated Hungary by supporting Hungary's struggle against Austria. From the moment he set foot on American soil, Kossuth was enthusiastically received. 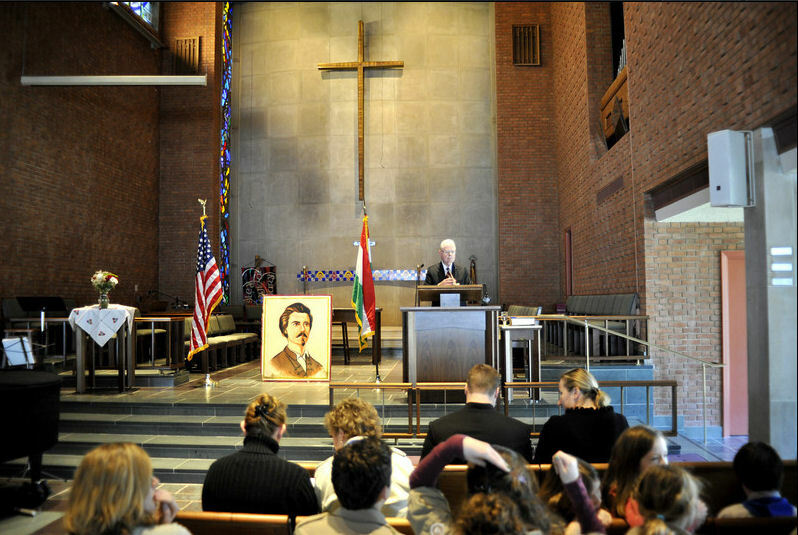 During his extended tour of eastern United States, Kossuth delivered more than 300 public addresses and lectures, including his famous speech in which he stated, “All for the people and all by the people. Nothing about the people without the people. That is Democracy, and that is the ruling tendency of the spirit of our age.” These words were uttered by Kossuth over a decade before President Abraham Lincoln's famed “for the people, by the people” speech given at Gettysburg in 1863. Kossuth’s triumphant six-month tour of America was an unprecedented success. Everywhere he went he was greeted as a hero, a champion of liberty. He addressed both Houses of Congress, met with President Fillmore and was hailed by Secretary of State Daniel Webster. During his stay, 250 poems, dozens of books, and thousands of editorials were written about Kossuth and his democratic ideals. 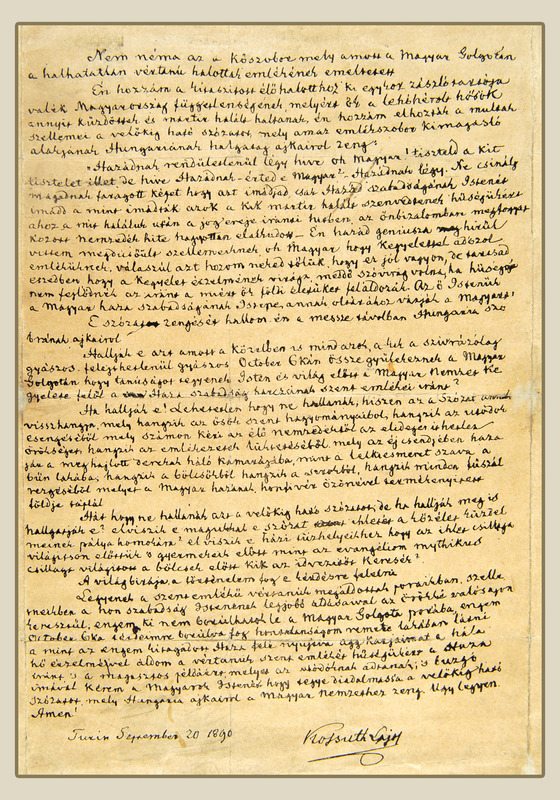 And his visit did leave a legacy in the United States that extended into the next century, as attested to by Theodore Roosevelt’s eloquent words when on April 2, 1910 in the Hungarian parliament he said, "There is no more illustrious history than the history of the Magyar nation. . . . The whole civilized world is indebted to Magyarland for its historic deeds.” These were sentiments that reverberated throughout America, at least for another ten years and then again in 1956. 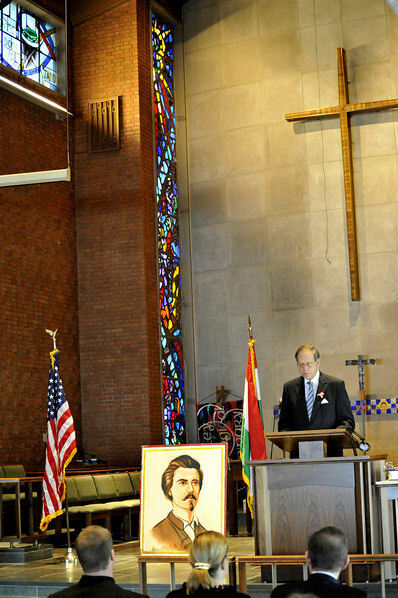 And yet, despite his eloquence and tremendous popularity, Kossuth was not able to convince the United States government to recognize the Hungarian cause and independence. When he turned to Henry Clay, by then an elder statesman, Clay explained that Americans did not help because by giving official support to the Hungarian cause, they would have abandoned their “ancient policy of amity and non-intervention." And so what is my point this afternoon? 1. Well, first, the United States is no longer pursuing a policy of isolationism and Hungary is a NATO ally. 2. 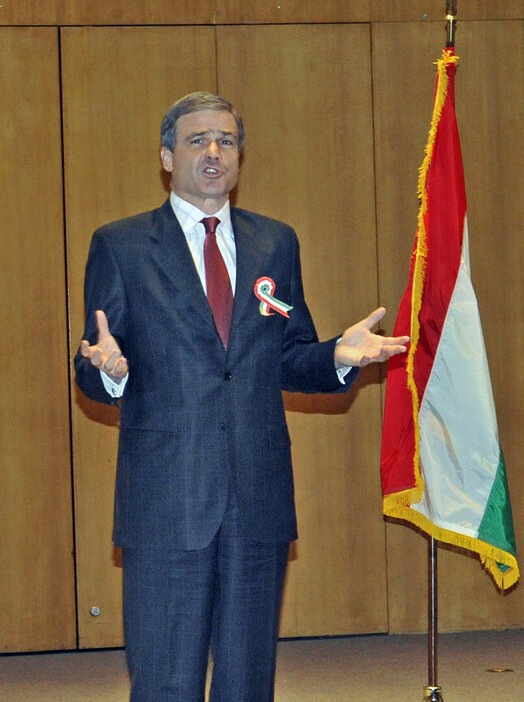 Second, Hungarians still have issues which must be resolved. 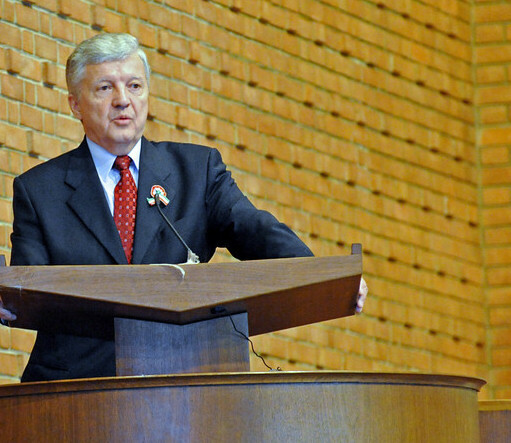 For example, one finds mischaracterizations about Hungary, as we recently did when we read an incredible reference to Putinization of the country in a respected newspaper; or when Romania flouts constitutional guarantees to the right to an education in the mother tongue; or when Romania fails to restore the independent Hungarian state university in Kolozsvar and virtually treats the legitimate request for autonomy of the Szekelyland as an act of treason; or when Slovakia adopts a discriminatory law restricting the use of Hungarian in the public sphere; and I could go on. 3. 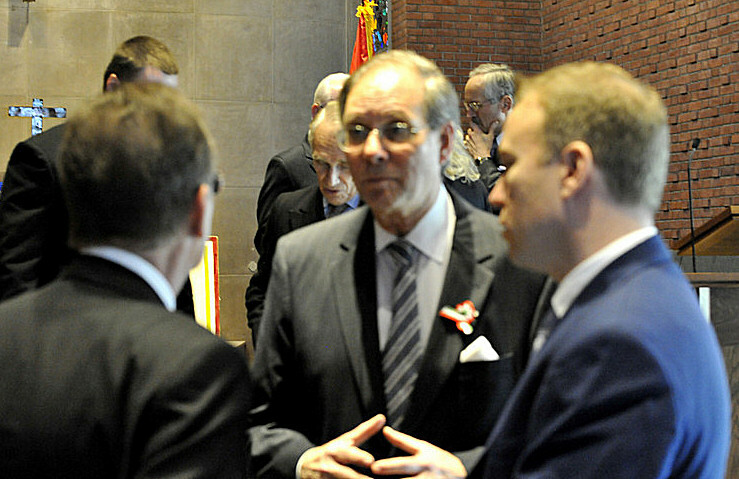 Third, resolution of these issues is in the best interest of the United States, as it would promote stability, democracy and prosperity in Central Europe. And this is where Kossuth’s example comes into play. We can also educate the public in our communities about these critically important matters. 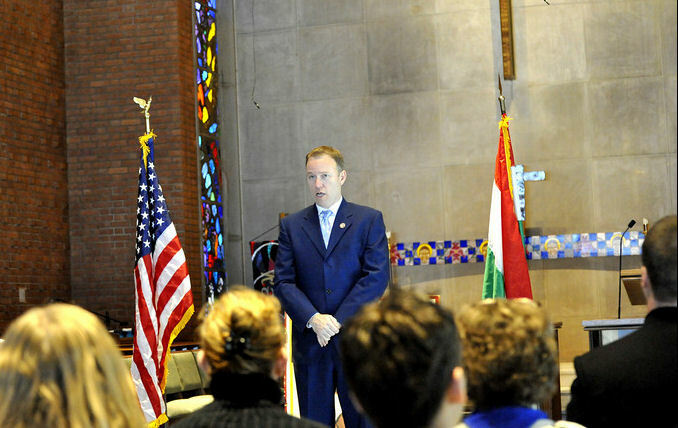 As Americans knowledgeable about the history, cultures and realities of that part of the world, we are in a unique position to influence our government; to speak up; to write articles, letters to the editor; to meet with our congressional Representatives; to educate, educate, educate and thereby dispel faulty information about Hungary resulting either from ignorance or motivated by political considerations and support policies that will promote democracy and minority rights. As a community we must reach out and involve younger generations in this exciting and challenging task. 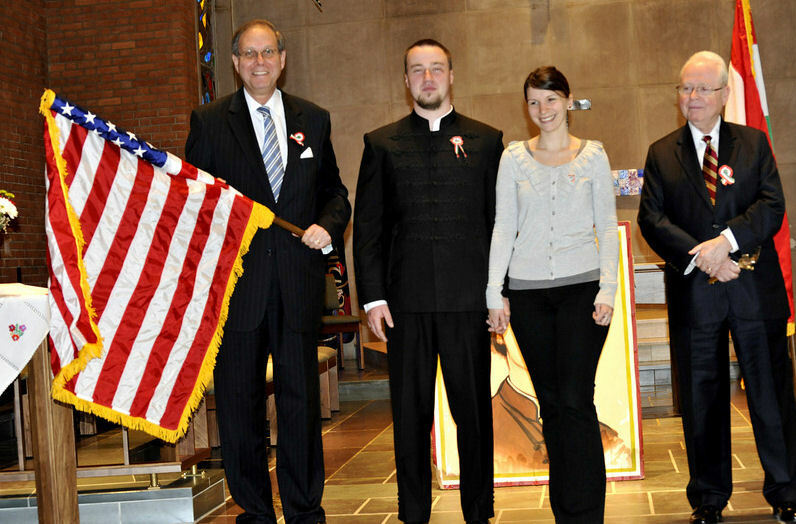 We must find and assist those Hungarian Americans who although not fluent in Hungarian, nevertheless are consciously aware of their cultural traditions and are poised to enter the professions, business or government. We must engage in a persistent, tireless and, above all, professional effort to educate and counter misinformation. We need people and organizations knowledgeable about politics and the political process. 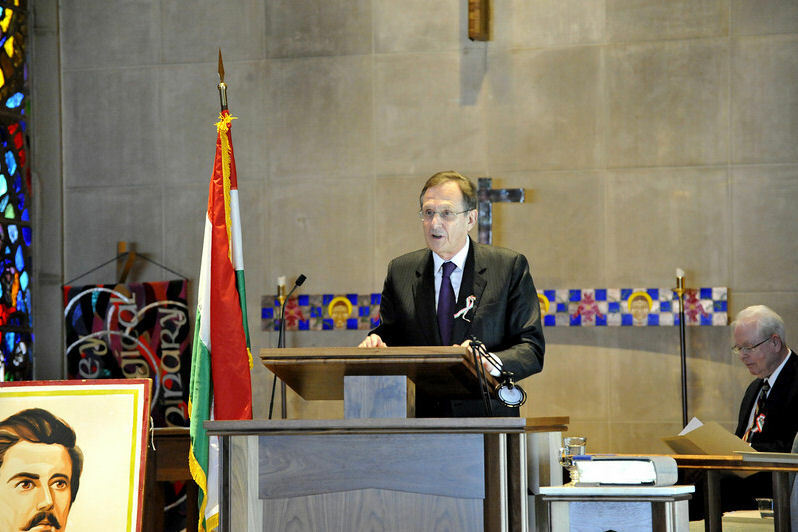 Let us reach out and find all who want to participate in this noble quest which will ensure democracy for all Hungarians and advance the foreign policy interests of our great American homeland. 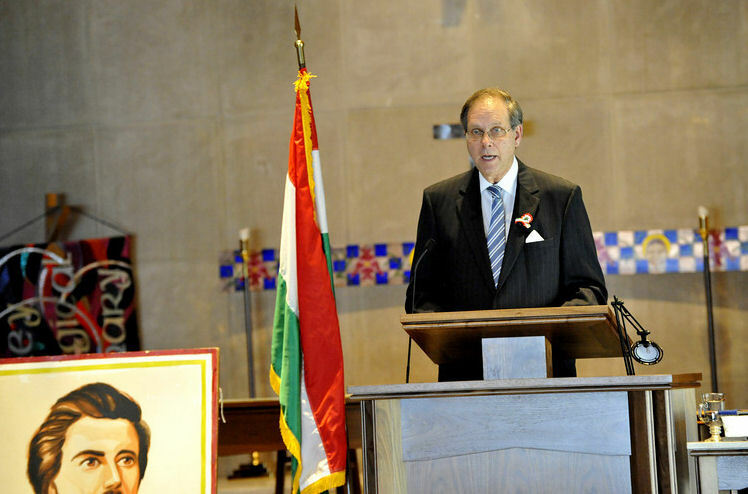 As we commemorate March 15, let us not stop with Kossuth’s triumph and inability to secure America’s support for the cause of Hungary’s freedom, but let us unite and seize the moment so that 2011 and beyond will be a success of historic proportions." 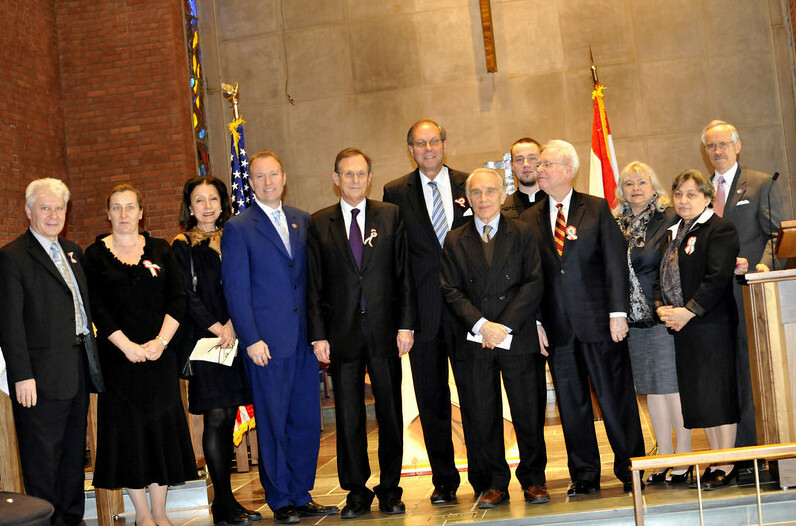 Members of the the The 4th Bátori József Hungarian Scouts Troop of Washington, DC, provided a major part of the program. 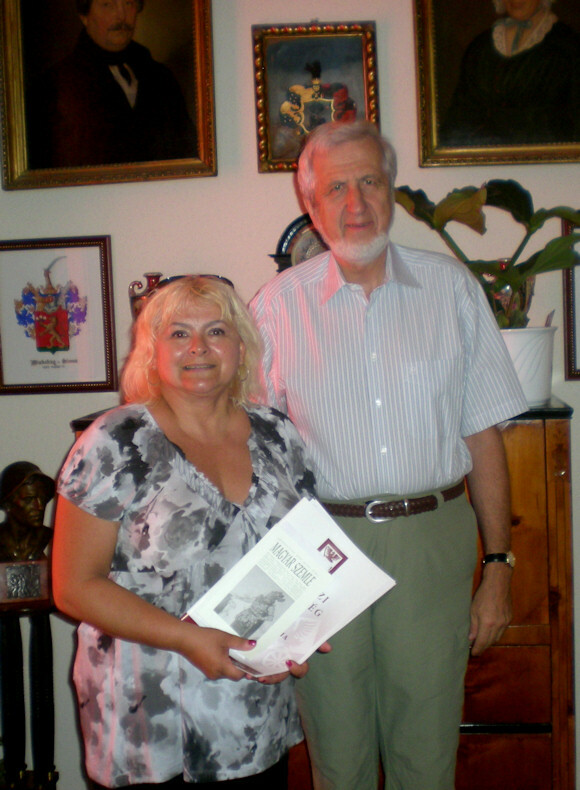 Lydia Nyerges performed a flute solo of Antonio Vivaldi's Largo and later, with the portrait of Petőfi Sándor by Gabriella Koszorus-Varsa behind her, recited his Nemzeti Dal. 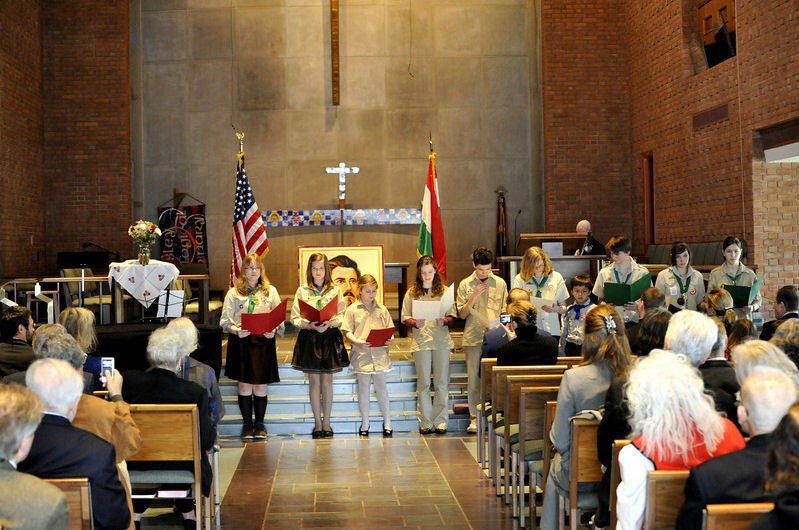 Members of the Hungarian Scout troop gave additional readings and ended the program with "Kossuth Dalok" (Kossuth Songs). The Revs. 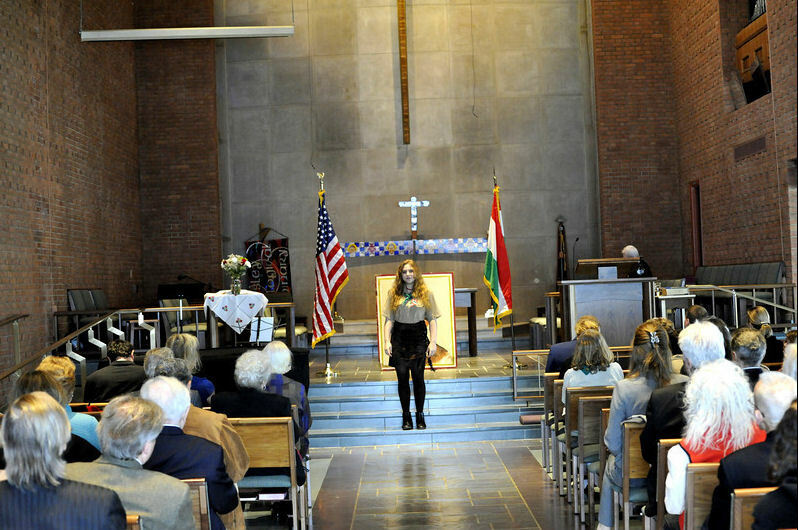 Judit Mayer and Peter Pal Cegledi of the Hungarian Reformed Church of Washington, D.C., provided the benediction and closing remarks. 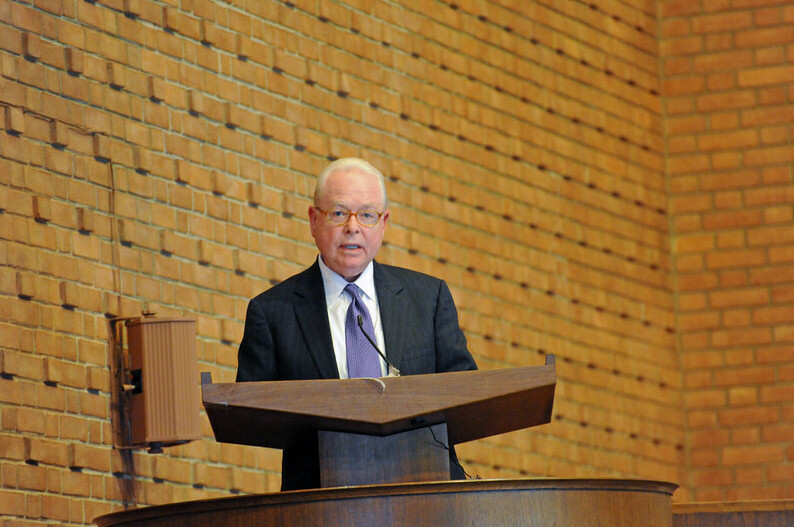 Photos courtesy of Dr. Imre Nemeth. "Történelmünk, közös hagyományaink nemzetmegtartó erejét nem szabad alábecsülni, és nem hagyhatjuk elveszni azt. Hiszen ez az elemi erő az, amely a hányattatott sorsú magyar nemzetet a Kárpát-medence ölében évszázadok óta egyben tartja, és láthatatlan szálakkal köti össze a tengerentúli magyarságot az anyaországgal.